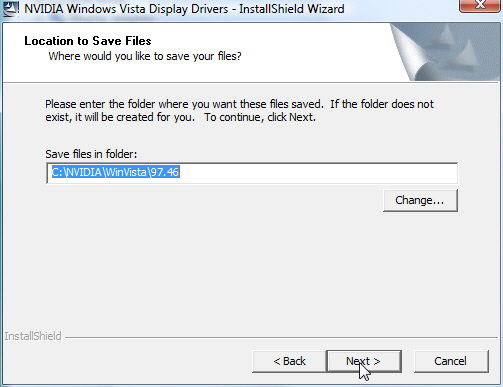 Installation of the NVIDIA Forceware display driver for your graphics card uses an Installshield wizard to simplify the installation process. There may be times where there may be a software conflict with the Installshield wizard that prevents it from installing the drivers correctly resulting in error messages during the installation. If this happens, you will need to install the driver manually using the Microsoft Windows Hardware Installation Wizard. Before proceeding, please verify you are logged in with a user account that has Administrative privileges. Otherwise, Windows Vista will prevent you from proceeding with the installation process. 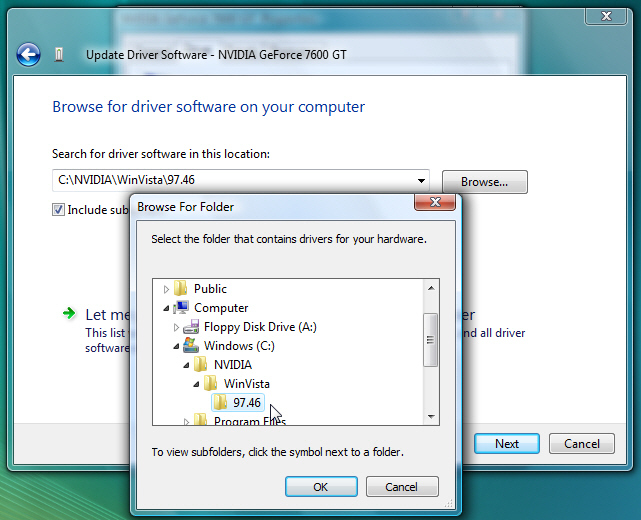 To install the NVIDIA Forceware display drivers, please following the instructions below. 2) Start on the first box and choose "Graphics Driver" -> on the second box, choose the graphics card type you are using -> choose "Windows Vista x86" from the third box and finally press the "Go" button to proceed to the next page. You will be taken to the download page for your graphics card. 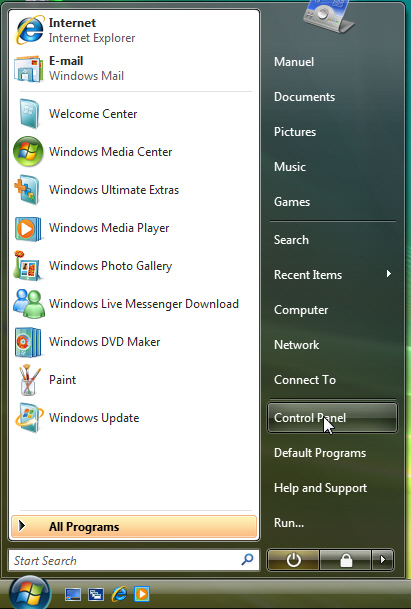 Download the driver to either your Windows Desktop or any predetermined download folder. 3) Once the download process is finished, double-click on the file in the directory where the driver was saved to. 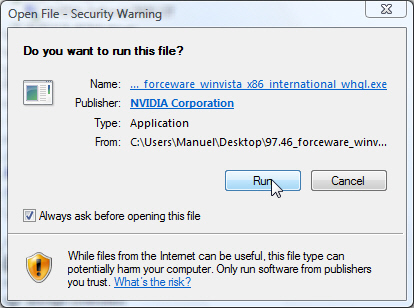 You will be prompted with a security warning by Microsoft Windows Vista asking if you wish to run the file. Select Run. 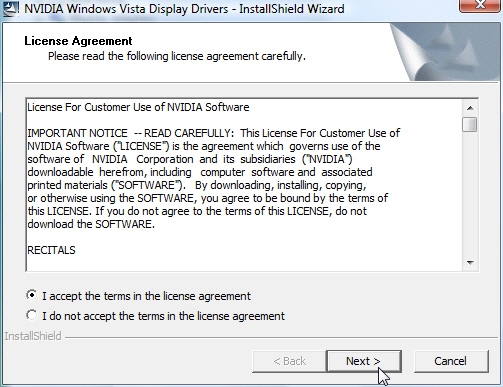 4) A window will appear with the license agreement. Once you have read and agreed to the license, click on the "I accept the terms in the license agreement" radio button followed by "NEXT >" button. 5) Next, you will be prompted with a location where the installation files will be saved to. You may use the default folder or change the location by clicking the "Change" button. Please keep in mind the folder location as you will refer to this directory when performing the manual driver installation. Click the "Next >" button to proceed. 6) After a few seconds, the files should be extracted. If you are prompted with a window asking if you wish to overwrire files in this directory, press the "Yes to All" button. 7) Once the extraction has reached 100%, cancel the Installshield installation wizard since we do not want to continue with the rest of the installation. 9) This should bring up the Control Panel. 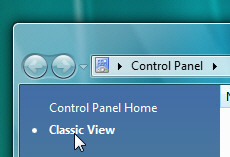 Verify the Control Panel is in Classic mode by clicking the Classic View link on the top left corner of the window. 10) You will see a long list of icons. Find the Device Manager icon and double left-click to launch the Device Manager. 11) From within the Device Manager, locate the "Display adapters" icon and left-click over the "+" to expand. Underneath you should see your graphics card model. 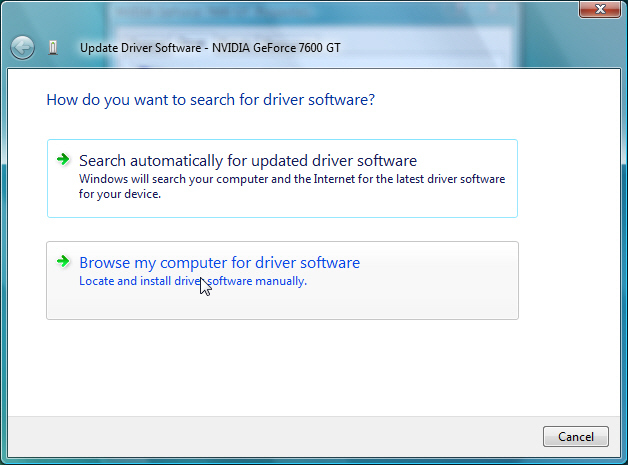 Right-click over your grpahics card and select "Update Driver Software". 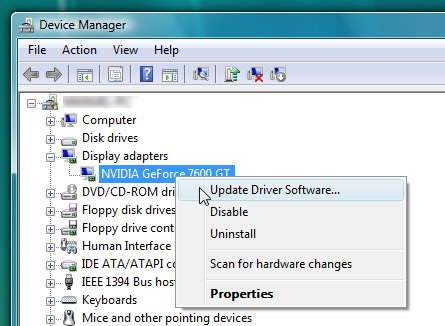 If you are installing the graphics card for the first time in your PC or you are performing a clean installation of Windows Vista, your graphics card may not be listed under the icon "Display adapters" but rather under the icon "Other Devices" with a yellow exclamation bang next to it as a "Video Controller (VGA Compatible)". Right-click over the "Video Controller (VGA Compatible" and select "Update Driver...". 12) An installation wizard panel will appear. Select the option "Browse my computer for driver software". 13) On the next window, you will be prompted for the location of the driver files. Click on the Browse button and navigate to the folder location where the driver files were extracted to. Then press the OK button. The wizard will detect and install the necessary drivers for your graphics card. After the wizard has completed, please restart your PC to complete the installation.